It was really a bad night for Chelsea yesterday and most of the Chelsea fans won't want to remember this few year time. Chelsea started Cahill, Azpilicueta, and Christensen in the heart of the defense but an injury in the 28th minute to Christensen force an early change from Antonio Conte and he was replaced by Antonio Rudiger. Bournemouth broke the deadlock shortly after the second half begins through Callum Wilson and two quick goals from Junior Stanislas and former Chelsea player Nathan Ake took the game away from the reach of Chelsea. Antonio was short in attack and he had to play Hazard upfront and both Barkley and Pedro were supporting him. Michy Batshuayi already departed for Borrusia Dortmund and new signing Olivier Giroud was and eligible to play. "I think they deserve to win the game and I'm right to say this, they deserve to win the game and we tried to do something but today it was very difficult for us even in the first half when the result was O-O, I think we struggled a lot." "We struggled for many reasons, but it's not important to speak about excuses, they deserve to win and we need to restart to work and do our best. We have to accept it's a bad result and understand that we have to fight this season if someone didn't understand this they don't understand football. Football is not simple." 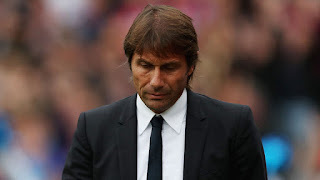 "I don't this [Christensen] affected the defence or the team, in other circumstances, we play in the same way and win, I repeat today is a bad day and they deserve to win and we have to accept the result and bad mistakes. "In the past with a striker, we have chances and still don't score. I think now is not the right moment to speak of the transfer market for me. It's not important, it's important to work and do best with my players." Chelsea is now fourth on the League Table and only two points ahead of fifth-place Tottenham Hotspur.